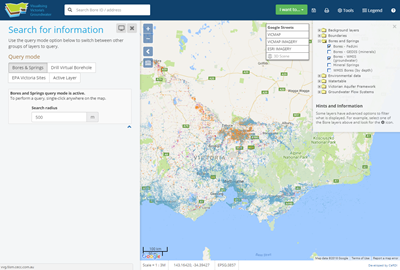 The VVG portal contains extensive information on nearly 300,000 bores across the state of Victoria. These instructions are a quick guide on how to use the map. Please be aware that the system is regularly being refined and updated and these instructions will be updated from time to time. Note: If you have an Apple Mac, find out how to navigate the portal here. There are several ways to navigate around using the map interface, your pointer device (mouse) and your keyboard. If your mouse has a scroll-wheel, you can use this to zoom in and out. Hold the SHIFT key down and draw a box on the map to zoom into the specifid area. You can also use the '+/-' icons in the top left hand corner of the map to zoom. Zoom in and out: scroll the mouse wheel up and down. Zoom in only: double left-click the mouse over the area you would like to zoom in. Zoom to a selection: hold down the shift-key and left-click and hold the mouse button then drag a rectangle over the map area. Zoom buttons press the zoom in or out button in the top left hand corner of the map (Figure 1). Left-click and hold mouse button in the map area and drag the mouse in any direction. Use the search box in the header section of the map portal. Start typing in an address. For specific properties, keep the format street number, street name, suburb in that order to ensure search is correct. Results will be refined and displayed as you type, click the relevant address and the map will navigate to the chosen location. Some layers will conceal / cover others. One way to remedy this is to reorder the layers, placing the concealing layer at the bottom. Click on TOOLS menu in the top right hand menu. Layers appear in order, so the top layer will appear above the other layers. Activate the layer by clicking on the text adjacent to the 'tick'box. This highlights the text. To get metadata (i.e. more information) on this layer, click on the next to the layer name in the 'Active Layer' part. Some layers allow additional search and filter options. Ensure the layer is turned on (box is 'ticked'). If you can see a "cog" icon in the active layer section you can click it to access these additional filters. On the right hand corner of the map will be a box with GoogleStreets, VicMap, Vicmap IMAGERY and ESRI Imagery. The legend for the currently active layer will be automatically displayed under the active layer section. Click on LEGEND menu located in the top right hand menu and the legend will pop up. To exit this function, click the 'Hand' icon. If you would like to unshow the 'Categories and Layers' on the right hand side of the screen, click on the icon under the +/- zoom icons in the top left hand corner of the map. To make it reappear, click on the icon again. As the amount of data layers available on VVG has increased, the querying options have become more complicated. We hope to simplify this in the near future. To query the map just click on the point of the map you are interested in, information related to that point will return information in the left hand side information panel. The type of information returned depends on the selected 'query mode'. The 'query mode' selection buttons are located in the search panel on the left-hand-side of the map. These options allow you to change between different query groupings. The default query mode is 'Bores' which will query for bores within a 500 metre radius of a single mouse click on the map. Other query modes are listed below. Bores: This mode will query the DEDJTR (GEDIS), DELWP (Water Measurement Information System) and FedUni Bores within a 500 metre radius of the selected point. Drill Virtual Bore: This mode will query the Victorian aquifer framework (VAF) surfaces for their values at that exact pixel location. It works in two steps. The first returns Surface, Basement and Watertable information. You then have the choice to query the other aquifer surfaces identified at the chosen point. Active layer: This performs a query on the active layer only (if one is chosen in the layer switcher). EPA Sites: This mode will query the three EPA Victoria Layers within the default 500m radius of the selected point. Audit Report Sites, Groundwater Restricted Use Zones (GQRUZ) and Priority sites. The 3D scene is a tool that allows you to see areas from the VVG portal in 3D. This includes aquifer layers, WMIS bores and surface elevation. There are many options for user customisation which are detailed in this user guide.